From the early creative stylings of “Crazy Diamond” Syd Barrett to the David Gilmour-fronted efforts of 1993’s The Division Bell, our list of the best Pink Floyd albums takes its entries from across an incredible decades-long career. The problem? That career saw multiple line-up changes and more experimentation than you can shake a drumstick at, leaving present-day listeners with a rich vein of musical wonders to mine, but no clue where to start. Our overall top pick for any nascent Floyd fan is The Dark Side of the Moon. Its dynamic shifts and creative engineering mediated by undeniable catchiness have made it one of the best-loved albums of all time, so it’s a pretty safe bet. New listeners will find rich rewards in the form of The Wall and Wish You Were Here, too, while those looking to go a little deeper can get their prog rock kicks on cult favourites Meddle and Ummagumma. Whatever shade of Pink you think you’re after, there’s sure to be something in our list that you’ll love, so read on, and enjoy – if not quite a Great Gig In The Sky, then at least a transformative listening party in your living room. Widely considered to be one of the best albums of all time, let alone Pink Floyd’s best, there was never any way Dark Side of the Moon wouldn’t take our number one spot. It kick-started the band’s career in the mainstream with radio-friendly singles Money and Time, and gave many their first taste of prog rock. While not quite a concept album, meditations on the oppressiveness of modern life – something we can all relate to – are everywhere, from the jingling cash registers of its big-ticket track to the maniacal laughter on opener Speak to Me. In a way, it’s lucky that Animals came out when it did: in 1977, not only had Floyd amassed a huge following, music fans were accustomed to prog and all its associated weirdness – like comparing your fellow humans to farm animals and inviting them to “have a good drown”, for instance. But while we’d do well to bear that in mind as we approach Animals, the reflective sonic comedown after the high that was Dark Side of the Moon, it’s certainly no bad thing. Direct and derisive, it takes a long, hard look at humanity in songs like Pigs, Sheep and the brilliant Dogs, while offering occasional respite with softer acoustic tracks like Pigs on the Wing. Not sold on the space rock aspects of earlier albums? Take this for a spin. The first thing you might notice about Wish You Were Here is that it follows its immediate predecessor’s trend for awesome artwork, its appeal is so much more than that. It’s perfect as a double feature with DSOTM for first-time Floyd listeners, offsetting the sharp dynamics and showiness of the former with a slower, more sustained, but no less satisfying listening experience. The 26-minute Barrett eulogy Shine On You Crazy Diamond might be the album’s crowning glory, but the funky bass and biting lyrics of Have a Cigar, the sinister swirling synth of Welcome to the Machine, and of course the bluesy licks and forlorn vocals of that immensely coverable title track all hold their own. 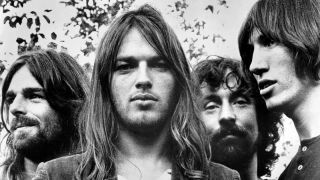 At the time of its release back in 1971, the music press weren’t overwhelmed with praise for Meddle, but the fact that it’s become a fan favourite says all you need to know about its lasting power. Straying from the deliberate all-out weirdness of the late 1960s, what you’ll hear on Meddle, instead, is the sound of a band finding its identity. It begins with a simple pounding bass and flashes of synth on One Of These Days, and ends with Echoes, a spacey, slowly unfurling 23-minute masterclass in creating atmosphere. Even what we might identify as filler has its place, resulting in an album that’s not just immensely likeable, but one that’s prog personified. Despite its origins in Roger Waters’ dissatisfaction with fairweather fans and rock star life, The Wall is surprisingly packed full of radio-friendly tunes: the head-bopping disco backing and anthemic chanting of Another Brick in the Wall (Part 2), the bluesy rocker that is Young Lust, even the curiously tender acoustic stylings of Mother. Still, it manages to strike just the right balance between catchy and high-concept, filtering its cracking tracks through the story of Pink, a Waters-like rockstar navigating everything from the loss of his father in the Second World War to his wife’s infidelity. Oh, and it’s home to a Floyd favourite, the incredible, desolate Comfortably Numb. There’s nothing not to love. While the release of The Piper at the Gates of Dawn might have signified a change in the band’s fortunes, it’s still a wonderfully bittersweet listen. Marking the undisputed high point of Syd Barrett’s creativity, it’s a real freakout fest befitting of its late-sixties release date, replete with stories about unicorns, gnomes, and more besides. Little licks of organ, super-synthesised guitars and bass, jamming interludes and some, at times, surprisingly simple lyrics all go into making a standout psychedelic album. For those well-acquainted with the biting anger of Animals and looking for more, this damning indictment of war should be the next one in the listening pile. The Final Cut has been described by many as a Roger Waters solo album in disguise, but while fractures between bandmates and growing egomania meant a conspicuous absence of the now recognisable Pink Floyd sound, the album emerged as one of the band’s most lyrically accomplished, evident everywhere from the sending-off anthem of The Gunner’s Dream to the vicious attack on “incurable tyrants” Thatcher and Reagan in The Fletcher Memorial Home. Ummagumma came at a tricky point in the band’s career, released just after Syd Barrett was replaced by Dave Gilmour. Nevertheless, its combo of live and studio discs offers a lot for listeners to get their teeth into – studio track Careful With That Axe Eugene and the live rendition of A Saucerful of Secrets offer a suspenseful sonic experience, and the surprisingly un-psychedelic Grantchester Meadows is an acoustic standout. While its experimental weirdness might be a bit much for first time listeners, it’s a natural and enjoyable next step for fans looking for some deeper cuts. That one of A Saucerful of Secrets’ album tracks was gifted with the working title The Most Boring Song I’ve Ever Heard Bar Two might not fill you with confidence, but put that down to painfully English levels of self-deprecation, because despite the fact that this record found the band rudderless in the wake of Barrett’s departure, there are some choice moments indicating the promise that was to be fulfilled in spectacular fashion in the coming decade. The brooding Set The Controls For The Heart of the Sun, with its frantic bongos and organ solo, indicates a darker direction, while the title track is a precursor to the tighter, finer, crescendo-laden jams that the band would soon come to be defined by. The Division Bell is the album that saw Pink Floyd return, repackaged, for a new decade, this time with David Gilmour at the helm. With a leaner line-up and a sound that took full advantage of new technologies, it was a world away from the cacophonous jam breakdowns of three decades previous, but that’s far from a criticism. It might be a good deal cleaner and glossier, but there are elements of vintage Floyd to be found everywhere, from the sweeping elegance of the elegiac Poles Apart to the bass- and organ- driven bluesfest that is What Do You Want From Me. While understandably not a favourite of Waters diehards, it still packs a sonic punch and a pleasing cohesion missing on predecessor A Momentary Lapse of Reason. Play it loud and proud with our list of the best soundbars.